1). Combine brown sugar, lemon juice and cinnamon and whisk to blend. 2). 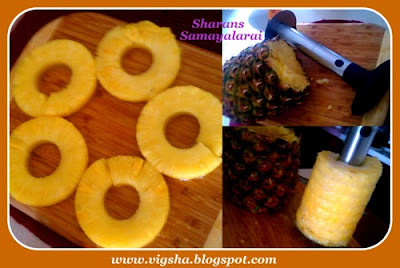 Trim, core, peel pineapple and cut into rings. 3). 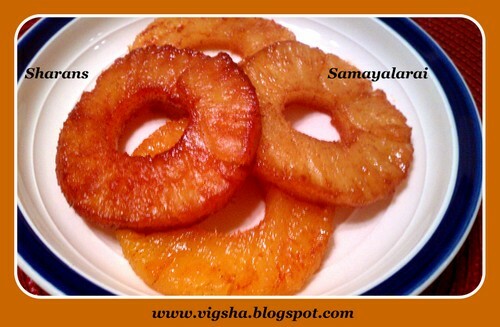 Marinate the pineapple rings in the above mixture and place it in the refrigerator for at least 30 minutes. 4). Pre-heat the grill to medium heat. When it is hot, lightly coat the grill rack with cooking spray or oil. Place pineapple rings on the grill. 5). Cook approximately 4 minutes on each side (turning so that grill marks are on all sides) until the pineapple becomes fragrant and starts to dry out on the surface. 6). Remove to plates, and serve it warm !! Grilling caramelizes the sugar and intensity of flavor. These rings are light and refreshing. 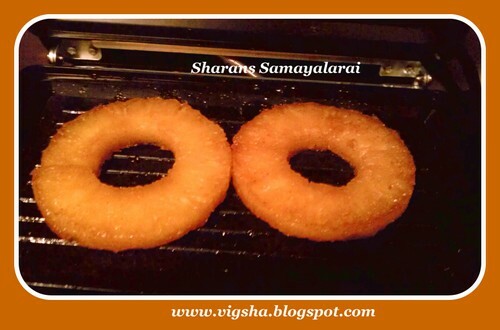 # If Pineapple is sour, while grilling sprinkle more cinnamon and sugar on the rings. # If you are using canned Pineapples, wipe dry and use it. 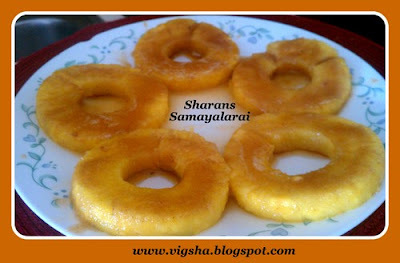 # Don't overcook the pineapple rings or they'll turn mushy. The natural sugars in fresh pineapple caramelizes quickly as it is grilled. 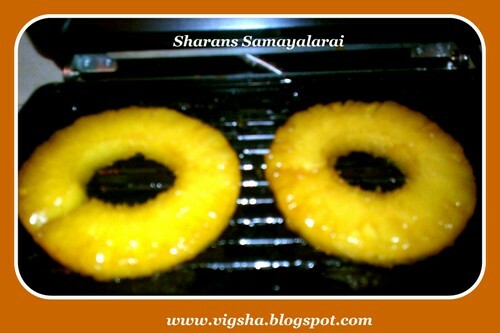 # You can also cut the pineapple rings into wedges for easier handling, just thread onto skewers before grilling. # Smell the pineapple when purchasing. The stronger the smell, the riper the fruit. Very new to me. Excellent dessert. Bookmarked it. 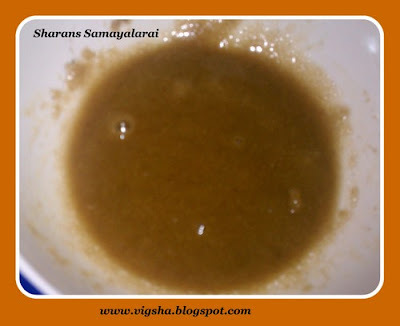 Hi Sharans, this is an excellent dessert. I'd made several times to serve with pineapple bars. 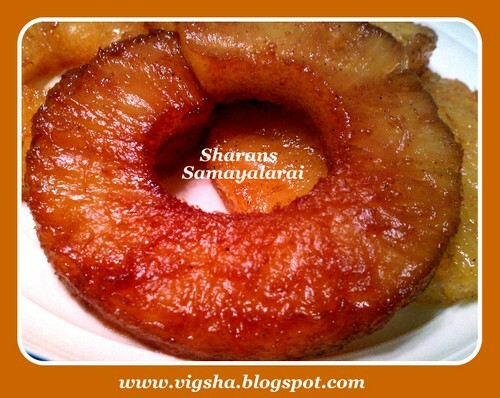 And you can slice it very thinly and grill it until dry to make pineapple flowers as cake decoration. The recipe is in my blog under pineapple coconut bars. You can use your above recipe to grilled banana, very delicious too. what a lovely recipe! thanks for following! following u back! Yummy rings. New to me. Hi! Sorry for such a late reply! Can you please let me know if you've liked my FB page or not? I have the roundup for Bake Fest. But the giveaway requires one more criteria to be fulfilled and that is liking my facebook page! ;) Please let me know by today so that I know if can include your name. drool worthy rings, i made somewhat similar yesterday, check my blog. Waiting for your rings to make entry in my First Event and Giveaway.